Your kids aren’t going to remember what you get them for Christmas. They’re just not. My mother died when I was a teen, my dad when I was in my early twenties. And when I think of the holiday seasons with them, I remember them. I don’t remember their gifts. I remember my mom stomping down snow and scattering bird seeds to feed the menagerie of winged color that knew where to find a good meal. I remember slow evenings around rock and wood and fire. I remember egg nog, sipped slowly, and luminaries of sand and wax. I remember Christmas Eve walks with family, sometimes comfortable and sometimes minus twenty. I remember their love, not their presents. Remember, the one with the most toys does not win. Your kids don’t need more stuff. They need you. To put it bluntly, there will come a Christmas without you. Hopefully, it’ll come much later, but it might come sooner. That’s not a morbid thought, it’s a centering thought. Your kids will always have stuff. They will not always have you. So hug them. Read to them. For Christ’s sake, be silly with them and show them that joy exists outside of presents. Dance with your children and make memories. Watch Elf together and belly laugh. Schedule some down time. Block it out on your calendar because it’s important. Say no to something so you can say yes to something better. Pause long enough this holiday season to cuddle with your little one. Or listen to your big kid. Don’t spend so much time watching football with your kids that you never play football with them. Remember: it’s not about stuff. It never was, and it never will be. Stuff fills our hands, making it harder to touch another person’s soul. Stuff fills our ears, blocking out the heart-cries of the near ones. Stuff fills our eyes all the way to the periphery, keeping us from seeing the tremendous value in the people right here. Remember, the best memories are not made of money. The best memories are made of people and places. If you have money, spend it on memories. If you don’t have money, that’s ok too, because money’s certainly not a prerequisite for memories. Remember, for this Christmas and the ones to come, the gifts won’t be remembered. Your presence will. Or your absence. 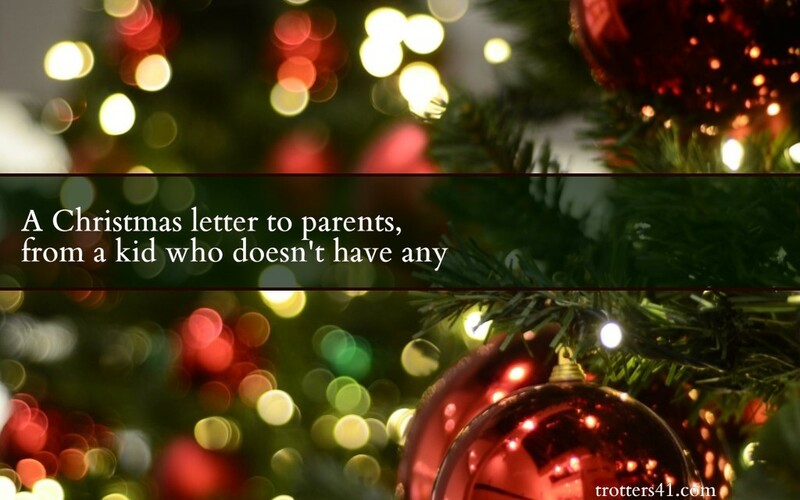 Both of my parents are absent now; I can’t change that and neither can they. But while they still could, they gave me memories. And I do remember. I remember my mother’s last Christmas. She was sick and we all knew it. That last Christmas morning, she sat on the couch and held a large stuffed bear and watched her children. And she smiled. And that smile remains one of the best Christmas presents I’ve ever received. Would it be ok to post this on Face book or send out as emails? I had seen this earlier and wanted to read it but because of a crazy week, only got to it now. Thank you thank you thank you! As my 5 converge from all parts this is a wonderful reminder. We had already decided to just do stockings this year – and I realize there is so much richness to this season that can never be captured in money or gifts. Merry Christmas to two of my favorite people. (that would be you and Elizabeth) Am I allowed to have favorites who I haven’t met? Damn straight. So what happens when you have no family. How are you going to tell me christmas is about family when no one speaks to eachother or they are all dead? What then? I guess I drink and blow money on myself. Or be another statistic.